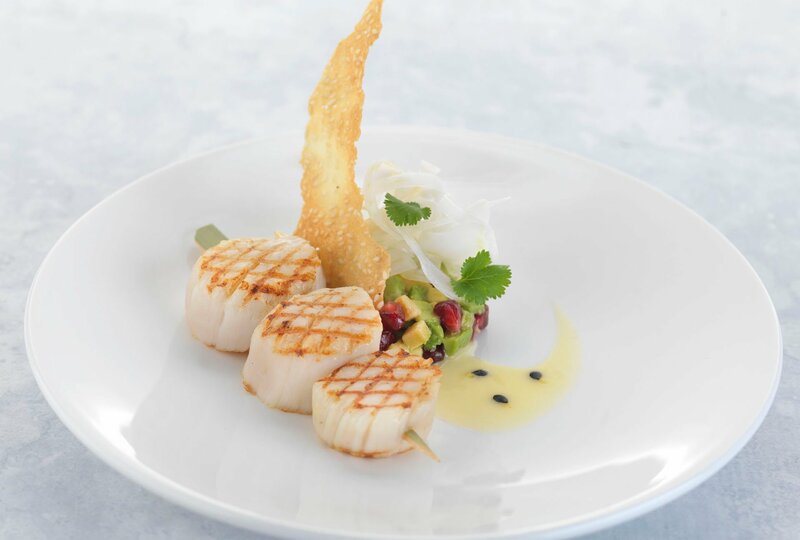 This surprising dish combines various flavours; the sweetness of scallops, the acidity of passion fruit, and a refreshing twist from the fennel, avocado and pomegranate salad. A sesame tuile provides a crunchy texture. Note : there will be some tuile mix left over; these will keep in an air tight container for 3 days. Remove the scallops from their shells and discard the roe and (skirt/beard). Clean the scallops in cold water. Pat dry on paper and refrigerate until required. Cut the passion fruits in half and scoop out the pulp. In a small pan combine the passion fruit pulp with the coconut milk and reduce until a syrupy consistency is achieved, about 3 to 5 minutes. Pass through a sieve to remove the black seeds, reserving some for plating if desired. Add lime juice and some sugar if necessary (depending on the sweetness of the passion fruits). Set aside until required. Pre heat the oven to 180°C. Line a baking tray with parchment paper. In a bowl combine flour, vegetable oil, sesame seeds, and egg white. Season with salt and Cayenne pepper. Spread a thin layer of batter about 1 mm thick onto the prepared tray and bake until golden brown and crisp to touch, about 5 minutes. Allow to cool then break into abstract shapes. Using a mandolin thinly slice the fennel. Peel and dice avocado into small cubes. Remove the seeds from the pomegranate. Pick the leaves from the coriander. In a bowl combine the fennel, avocado, pomegranate and coriander leaves. Season with olive oil, lime juice, Cayenne pepper and salt. for a total of 2 to 3 minutes depending on size. Arrange the salad in the middle of the plate. Place a scallop skewer to one side. Using the back of a spoon apply some dressing to the plate and top dressing with reserved passion fruit seeds if desired. Finish with a shard of sesame tuile.